Deli is a China professional office supply manufacturer. We are able to provide a variety of office supplies such as stapler, desktop set, paper punch, pencil sharpener, etc. This is our permanent marker pen, you can find other similar products of different functions by clicking the below icons. Welcome you to browse and choose! 1. There are different kinds of pen-nips for your option. 2. The ink marks will not trade and features quick dry, nontoxic. 4. It feels comfortable to hold our Permanent Marker Pen. 5. The ink quality of our Permanent Marker Pen has passed national safety inspection. 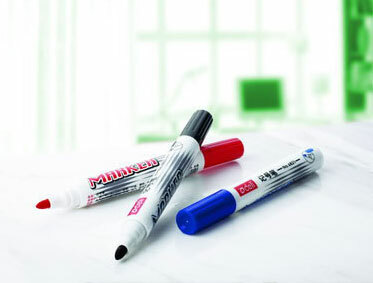 Permanent Marker Pen, a kind of writing tool, is applicable to cartons, wood, cloth, plastic and metals etc. Besides various kinds of writing equipments (e.g. ball pen, gel pen etc. ), Deli, as a stationery supplier, can provide many other office supplies. We are looking for international partners, welcome to contact with us. » Highlighter 1. Imported ink. 2. Colors are bright and light-resistant and water-resistant. 3. Flap highlighter and it holds comfortable. » Stapler 1. High quality: Our staplers are produced with strict quality management system. 2. "Twice injection and once molding" technic is adopted.